On Martin Luther King Day 2019, we are hopeful for our future. There’s a lot of negativity in the world right now, a lot of which we can’t control. However, one thing we can do is control how we feel and how we use those feelings to impact the world around us. It’s interesting to think about ‘creative altruism’ in these dark times we live in. Everyone is struggling to get by, even those who seem to have it all. Yet we have a choice, to walk in the light or remain in the dark with our own self-destructive thoughts. So from here on out, dear reader, I’m choosing to be hopeful. I’d like to share a story of hope. In the summer of 2018, I had the opportunity to join the mission of Trinity Community Ministries in downtown Atlanta. Trinity (or TCM) is housed in a historic building on the same block as Ebeneezer Baptist Church. The building itself was once Hanley’s Funeral Home, where MLK’s body was prepared after his assassination. 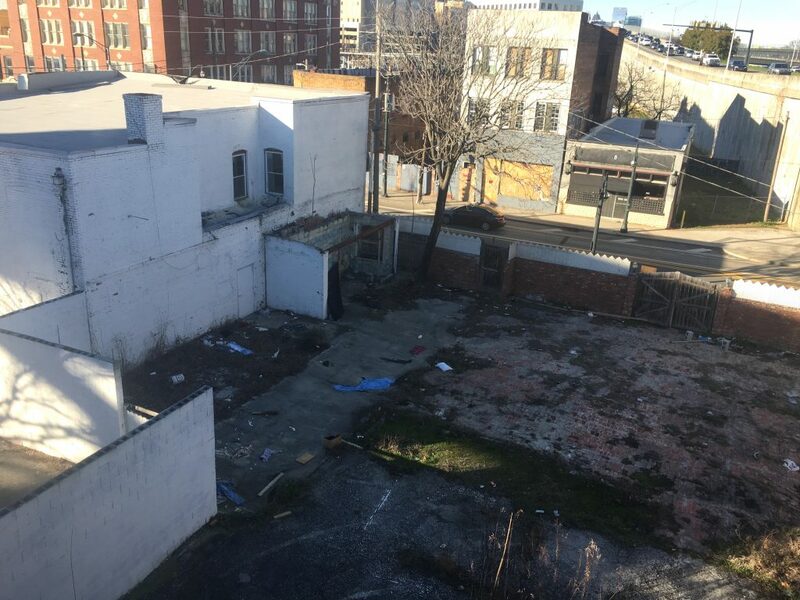 The tragedy of socioeconomic disparity is broadcast in broad daylight walking through Downtown ATL, especially since the shuttering of the Pine Street Shelter. Men and women are sleeping on the streets while the affluent commute to the glitzy office buildings towering above. I saw this poverty every day that I worked Downtown. Atlanta is not alone in this problem, but with our keen focus on Southern hospitality, we should be expected to do more. It’s why I wanted to help raise awareness for the good work happening at Trinity. 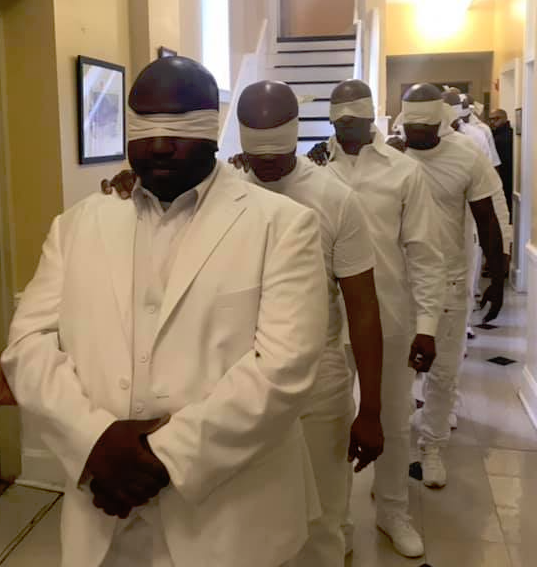 And on Saturday, Jan. 19, 2019, over MLK weekend, Trinity graduated 17 men from the Trinity House-Big Bethel program. This photo was taken before the Kalonji name changing ceremony. With every graduating class at Trinity, men are selected to be given a Kalonji name which will represent a new life after having been through so much. Kalonji means “Men of Victory” in Swahili, and all names are given in Swahili. “The significance of graduation represents the beginning of a new life… Graduation for our guys means that they have made a commitment, to fighting a good fight against addiction. The fight wasn’t easy but to understand that you have an addiction, made the step to understanding you are suffering from addiction, and making the step to fight it.” –Trinity Lead Case Manager, Clyde “Ali” Wilson. The staff, clients, and volunteers working in Trinity’s programs are actively working to eliminate poverty, build community, and foster peace through nonviolent social change. When a man is accepted into Trinity, he has to go through a phased approach to rehabilitation. Through his months at Trinity, he will focus on his recovery, become reunited with his family, and define his belief system. It’s important to note Trinity is non-denominational and does not preach one faith. All that is required is a man discovers his own spirituality, which is why the program gleans inspiration from African influences. Another example is the use of the word “hotep” throughout the program. It means “at peace” or “peace and blessings”. During my first visit to Trinity, I spent about an hour with a “senior brother” who was in prison before he came to TCM. He was facing felony charges of possession of crack cocaine with intent to distribute. Instead of jail time, the judge introduced him to Brother Ali (quoted above) which was basically a vetting process to be sure Trinity was the right fit. After getting into Trinity–and there is always a waiting list–after getting on a path to healing for overcoming his addiction, he learns more about self-care. Eventually, the guys are ready to go back to work and Trinity helps them with finding jobs. In order to graduate, the man must have a certain amount of money saved in his own checking account. So how can we scale Trinity’s success model? First, it’s important to see how far TCM has come since it was officially incorporated as a 501(c)(3) organization in 1988. In response to the growing homelessness in Atlanta, TCM began as an emergency overnight shelter in the basement of Trinity United Methodist Church (UMC). Over time, this community outreach expanded to provide food and subsequently added a Sunday soup kitchen known as Trinity Table. While TCM and Trinity Table are no longer affiliated, Trinity Table is still the only regular source of free food on Sundays in the area and now serves approximately 200 guests per week, aided weekly by volunteer residents of Trinity House. During the 1990s, TCM evolved into a transitional, residential recovery shelter with the mantra of “A Tough Program for Tough Times” and a reputation for helping men who truly wanted and were willing to work for sobriety, stability, and self-sufficiency. For guys on the street, Trinity has a reputation for being known as a tough program. In 2004, TCM entered into partnership with Big Bethel African Methodist Episcopal (AME) Church, the owners of the former Hanley Building in the Sweet Auburn District of Atlanta, where Dr. Martin Luther King Jr.’s body was prepared for his funeral, and where TCM’s administrative offices and Trinity House-Big Bethel program (the 36-bed supportive housing and rehabilitation) are still housed today. Trinity Living is TCM’s newest initiative. Launched in November 2012, and serves homeless men with disabilities, many of whom are veterans, in a permanent supportive housing environment. The program features eight, two-bedroom apartments leased in partnership with the U.S. Department of Housing and Urban Development (HUD) together with supportive services such as job readiness and placement, addiction counseling and rehabilitation, financial and life skills mentoring and management. And Trinity’s program works. Every three out of four men who come through the program never go back to the streets. Trinity Community Ministries would like to thank the Georgia State University School of Public Health student intern for TCM Chiamaka Nwokeocha for creating this amazing video about Trinity Community Ministries for her final presentation project. We would also like to thank her professor Dr. Carlos Pavao for introducing us to his students and helping us push forward with our mission and outreach to the Atlanta Community To watch the full video, Check out our Facebook Page! Don’t forget to Like & Share! So how further the success of Trinity and Dr. King’s mission to help everyone who is homeless and needy in Atlanta and beyond? Y’all know it all comes down to three things: money, dedication, and time. There are a lot of people who have donated to Trinity over the years, and good work has been done, but there’s so much more we can do. First, there’s a GoFundMe campaign to replace all the windows at Trinity House, which have become even more problematic this chilly winter. We’re very close to meeting the $75,000 goal for all the repairs. You can also donate to Trinity here. Next, every Friday from 11 a.m. to 2 p.m., Trinity hosts a fish fry. And as a food blogger, I can tell y’all this is some of the best fried fish in Atlanta. Your group, Bible study, or tribe of friends can also bring dinner to Trinity for a T.E.A.M. dinner. There’s also the Trinity Combine coming up in May 2019 so stay tuned for more details. On my most recent to Trinity for a fish Friday, I got to go on the roof of the building with Trinity Community Ministry’s Executive Director, Derek Duncan, and Lauren Priest, Trinity’s Director of Development. Derek shared his vision for how Trinity could build a new center on this vacant lot. “First one building, then another, the whole block, then multiple campuses throughout the city,” Derek said. I love this vision and am honored to be part of this mission. Want to be part of this story of hope at Trinity? If you want to join me for a fish Friday lunch or a T.E.A.M. dinner, comment below. P.S. – if you want to read the full transcript of MLK’s “I Have a Dream” speech, you can do so, here.